Mathew 14:31 …and immediately Jesus stretched out his hand. God created man with his hands from the dust of the ground and inscribed him in his palms. Why does the Bible describe about the hand of God and how we can see the hand of invisible God? Bible is not a fairy tale, so it is not like other holy books. The author of this book is God himself, so that no one should be able to boast. It is more than 2000 years old and is still living and changing hearts. It does not speak more than what is precisely needed for the revelation. The entire Bible is a book of revelation. One of the well-known poets once remarked, “I like Jesus but his thoughts are not matured”. Actually, our brains are not mature enough to understand the heavenly thoughts. So Jesus, instead of using those heavenly words spoke using simple examples of fish, mustard seed, olive tree and many more. Even the simple parables were tough for the people to understand…just imagine how much more difficult it would have been for them if he used heavenly thoughts. Today’s text is about Jesus walking on the water. Now Peter was also filled with a desire to walk on water and he surely did. But when he saw the wind and got afraid he began to sink. Now at that time, Jesus was there in the flesh. So Peter could see Jesus face to face and could touch him. That was the reason why Jesus stretched out his hands and caught hold of sinking Peter. But what about you and me? How can his helping hands reach us? How can we be saved when we start to sink in our lives? I have full assurance in the Lord that after you finish reading this, you will see the hand of God stretching towards you. Here, the hand of God means His work. The Holy Spirit has beautifully placed this incident in the gospels to make us understand that when we start to sink, there is always a helping hand, if we are ready to cry. In other words, there is always the work of God behind it. God has given us hands to work, build, serve and help but unfortunately, many use these in a wrong way. Instead of working hard, they remain idle and grow weak and lazy and instead of building, they destroy…I am not talking about practical hand over here, but I want to stress on our works and actions. We should never let anyone destroy our relationships; instead we should strive to build them. Let me ask a simple question: Does your talking and gossiping destroys the reputation of a person? If yes, then we should stop right there! Let us not destroy but try to build with the love of our Lord. From the beginning to the end, we see the hand of God working. We can see it in various phases. His hands were against some people, but for others, they were loving and caring hands. In Jeremiah 18, we see his hands shaping a marred vessel into a new one. What does this tells us? Man is helpless in every way of life and he needs Jesus to stretch his hand towards him. Is there anyone who is sinking in his or her life, needs help and does not see any helping hand? Let me encourage you. No matter what circumstances you are in, even if no one in this world would stretch his or her hands to help you. Come to Jesus. John 14:18 says,” I will not leave you orphans. I will come to you.” Dear friend, are you ready to come to Jesus today? See, if you take one step towards Jesus, He will take two steps towards you. He wants you to take the initiative and he loves everyone who seeks him. Psalms 34:4,” I sought the lord, and he heard me. And delivered me from all my fears.” Your best friend will leave you, but I have found a friend who is greater than all my best friends… Jesus Christ of Nazareth! Holy Spirit is my best friend, who helps me to cry out to my father when I start to sink in my faith. All our sins and grieves to bear! Please read Mathew 14:24 onwards (Take your bible and read it by yourself). Here we can see one boat in the middle of the sea tossed by the waves, and the wind was blowing hard against it. Is there anyone who is having a tough time like this boat? In the midst of problems, tossed by every situation, with all the people against you? Now this boat was in the middle of the sea…it signifies a person in problems. No one can help in the midst of problems and no support is there in this situation. Now in the fourth watch of the night, Jesus came walking on water in the middle of the sea. Did you notice that Jesus is walking on that same place where their boat is tossed by the waves? You may be overlooked by everyone in your problems, but Jesus can come to the place where your family and friends are not able to come. I used to wonder why Jesus waited till the fourth watch and when the boat was in the middle of the sea? I think since most of the disciples were fishermen, they were quite used to facing these kinds of situations. They tried with all their strength thinking their luck may help them to find a way to safety, but could not do so. Do you know why Jesus waited till the fourth watch? To give them a lesson: that they are helpless and weak in the middle of the sea; they were unable control the boat when tossed by the wind (but they could control it when everything was normal). You too can be in control when everything is normal, but what do you do when it goes beyond your power and you cannot control it? Is there anyone who is going through this fourth watch situation? Fourth watch is the time from 3am to 6am, when it is still dark. Notice the waves and the winds…even the time was against the boat. You might want to say that you are going through all this because of bad times and some people around you? Cheer up! Stop blaming time and people and learn to understand the will of God. You may have past experiences, but those will not help you to get out of the situation, which you are currently facing. No one can do anything in fourth watch, when everything and everyone is against you. I also had a fourth watch one year back when I lost my job. The time, the people, the situation and everything went against me, but I saw the hand that helped me. I thought it was all over and I will go back to my country, but these were my thoughts and my ways. I thank God for opening a new way, which I am not worthy of. I thank God for the fourth watch also, because by being in that situation I was able to see his hand. I thank Jesus for all that he did; all that he is doing and all that that he is going to do. Do not worry when there is no one to help you in the fourth watch. Be of good courage and see Jesus walking towards you in your fourth watch situation. They were afraid when they saw Jesus. It shows what tough time they had in the middle of the sea. The fear of death covered their faces in such a way that they couldn’t recognize Jesus. Sometimes we too, concentrate more on the situation we are in rather than focusing on Jesus and thus fail to understand and feel the presence of God in our problems. The fear led the disciples to waver in faith, so they failed to understand the work of God. They never expected that Jesus would come to them by walking on the water. For them there was no way someone could come and help them in their situation. But when every way is closed, our Jesus knows which way to come in! One day the disciples shut their doors and assembled in one place because of fear of Jews, but Jesus did not knock the door. He came inside and said,” PEACE BE UNTO YOU.” It is your thinking that all doors are closed but Jesus has His own way to perform a miracle in your life. Now Peter is a bold character among all disciples who wanted to walk on the water like Jesus. In other words, he wanted to imitate Jesus. This is what I learnt from Peter. He had an eager desire to walk like Jesus. How many among us imitate Jesus in our lives? Just think, how we transform ourselves when we talk to a small baby…we change our sound and action and just try to talk like them. Likewise, we must imitate Jesus by renewing our mind, by keeping his word and walking according to the word. Peter received the word to walk on the water, and he started to walk on the same water, where his boat was tossed by the waves. He is now walking on the situation, which was tough before. If we start imitating Jesus in our lives, the situations in which we could not walk before will become easy for us. Before I used to hate people but now I love them. Peter is walking on water because he is seeing Jesus, but when he saw the wind he started to sink. This is where we fall; when we move our focus away from Jesus and start looking at the wind and water… we see the situations and work out probability. Jesus said “FOLLOW ME”….then why do we need to follow the problem? ‘Follow him’ do not see the winds and waves in your life. See the one who has called you. He is still walking on water but you are sinking because you are looking at the wind. Peter cried for help because his fear led him to doubt, and doubt made him sink. 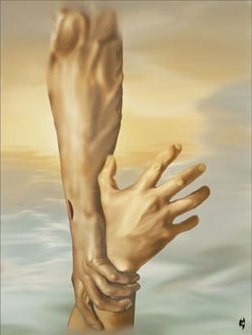 But Jesus stretched out his hand and saved the sinking disciple. Do you have something in your life that is sinking you? In case of Peter, it was the wind. What about you? Cry unto the Lord and he will stretch his hand towards you, no matter how deep you have fallen.